Of all the companies that built motor fire apparatus in America in the 20th century, none has acquired the cult-like following accorded the unique products of the Ahrens-Fox Fire Engine Company of Cincinnati, Ohio. With its front-mounted piston pump surmounted by a gleaming spherical air chamber, the Ahrens-Fox piston pumper projects irresistible aesthetic and mechanical appeal. 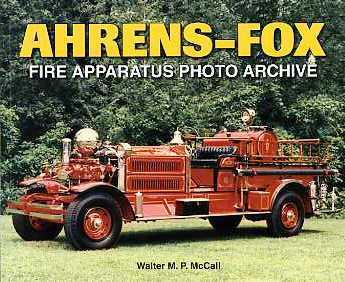 Fire apparatus aficionados and collectors have all but elevated the truly distinctive Ahrens-Fox piston pumper to a firefighting deity. Noted fire apparatus historian and author Walt McCall has selected the best of the best for this photographic tribute to a legendary nameplate—including the milestone Continental, mighty six-piston Models PS, BT and what is arguably the most beautiful fire engine ever made in America, the classic, semi-streamlined Model HT. A supplemental gallery of 32 color photos showcases some of the finest surviving Ahrens-Foxes.